Peter Pan The Christmas Pantomime! Peter Pan is the 2019 pantomime starring award winning Comedian Billy Kirkwood, West FM Presenter Bex Johnson and Panto favourite Russell Coid! 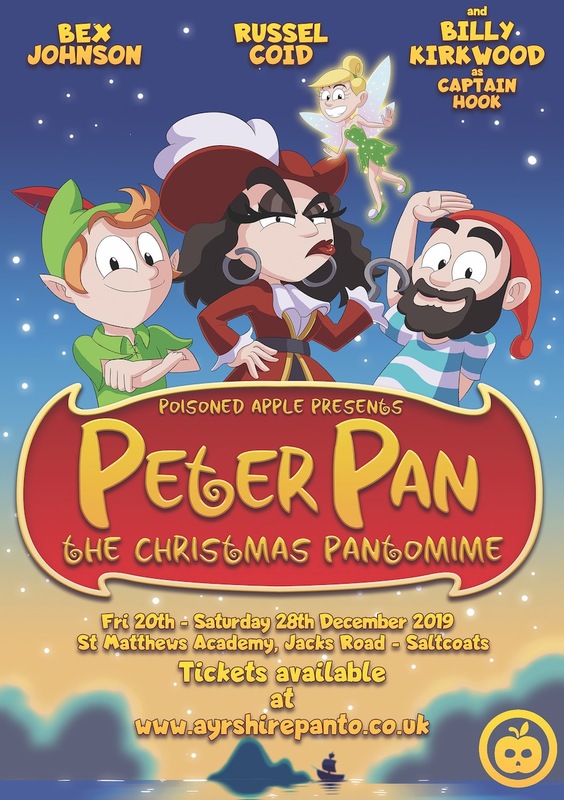 Peter Pan is presented by Poisoned Apple Productions at St Matthews Academy in Saltcoats this Christmas! Some of the fabulous cast of Sleeping Beauty, Aladdin and Robin Hood return to the stage this year to bring you Peter Pan! Join Peter, Wendy, John, Michael, Captain Hook, Smee, Tinkerbell, Nana, The Lost Boys, Mr and Mrs Darling, Street Beatz Dance Crew and the rest of our cast for a day of family fun, laughter and surprises! 5 Star Reviews from 2018. 'Love how all the cast spend time meeting the children and getting photos with them at the end.....well done on another great show! 'This was our 3rd year going to the Christmas panto, would pick it over all the other pantos around! The performance will be held in the Theatre in St Matthews Academy, Jacks Road - Saltcoats, North Ayrshire. St Matthews Academy is close to Ardrossan South Beach and Saltcoats Train Stations and sits close to the local bus routes.